Nothing like taking it easy on the sofa in Mom's spot guarding the remotes! Update: My Mom's Gamecocks lost to the Tigers 31-14. She said the weather was miserable and losing the game made it worse! At least the game was early in the day so she got home early tonight! No more football until the bowl game! 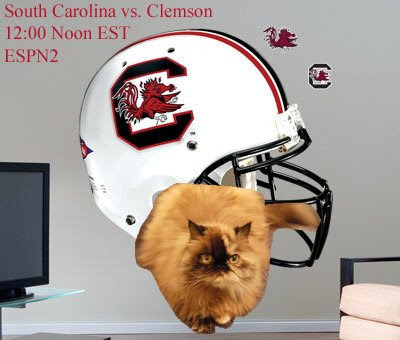 Today, Mom's South Carolina Gamecocks are playing their arch rival, the Clemson Tigers in football. Of course, my Mom has left to go to the ball game. According to the weather channel, there is an 80% chance of rain and the high temperatures will be in the 40s. I tried to convince Mom to stay home in our warm house and watch the game on TV with me, but she said she had spent too many green papers on tickets, so she was going. Keep your fingers crossed Mom doesn't get any sicker (she has been on antibiotics again this week)! Today is known as "Black Friday" in the states. I think it was named this because everyone tends to go Christmas shopping the day after Thanksgiving and the retail stores make the most money on this day. I decided that I was going to spend my Black Friday at home helping mom search for items in the catalogs and on the Internets! 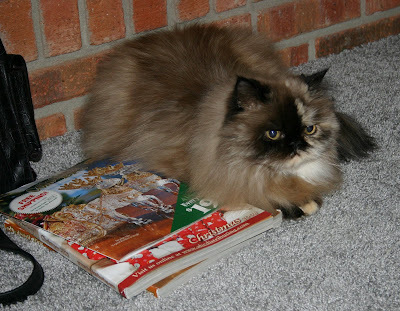 Look mom, I found three catalogs for you to look through! What do you mean you have looked at these, so now you are going shopping? Oh well, they make a good place to take a nap! Be careful if you go out in the mess of people today! Don't get into too many fights if someone has an item that you want. Just give them a hiss, the kitty stare, and they will drop whatever it is and run! 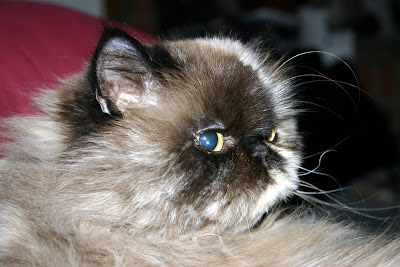 My Mom, Paula, who brought me into her loving home almost 13 years ago. A home with a roof over my head to keep me warm in the Winter and cool in the Summer. Plenty of stinky goodness and treats! 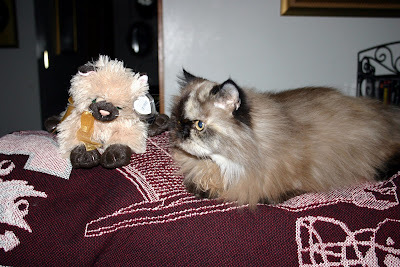 All of my new furriends on the Cat Blogosphere! Hugs, scritches, belly rubs, and kisses from my Mom. Paw Paw (my grandpa bean) because of all the treats he gives me. 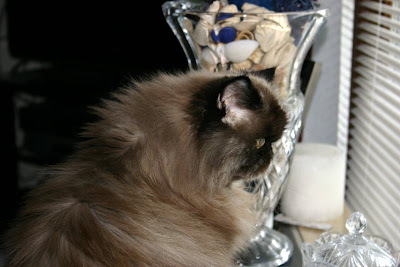 My Sweet little Praline, who has brought me so much joy and comfort! My parents who have been there for me through the good times and the bad times. My friends, old and new. This time Paw Paw (my grandpa bean) and I hid behind the clothes that Mom was folding from the dryer! 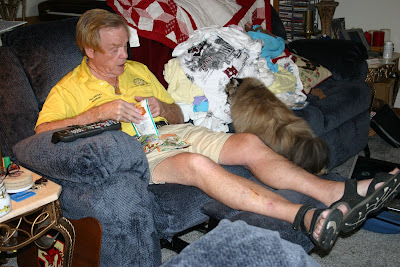 Mom couldn't see all of the treat bags on Paw Paw's lap, so I got bunches of treats! Paw Paw, can I have some treats? Paw Paw: Yes, you can have all you want since your Mom isn't watching. 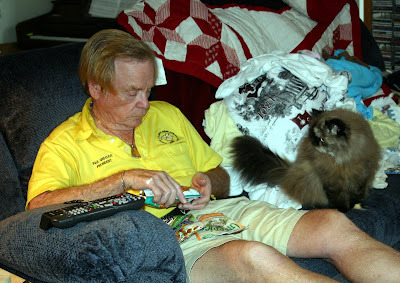 As you can see, Paw Paw had three different bags of treats on his lap and he gave me treats from all three bags! Isn't my Paw Paw great? I am not so mad with my Mom anymore. We have been able to visit a few more of our friends the past few days. However, I must stay very close by her on the sofa to make sure she helps me visit. I hope to visit a few more of you this week! Mom! Don't forget to visit Jasper, and Goma, and Maggy, and Zoey, and Anna, and Zuzu, and Victor, and . . . Mom: Shhhhhhhh. She's sleeping. Aren't those the cutest little paws? Today's Photo Hunt theme is "Reflection." Mom went back to my baby pictures and found one of me when I was around 1 year old. 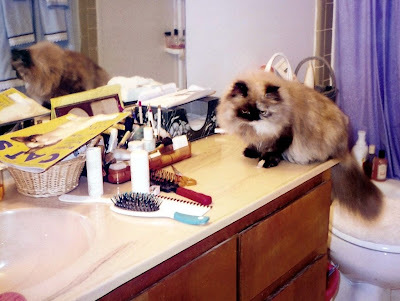 This was the bathroom in our apartment when my Mom was working on her Ph.D. at Clemson University. This bathroom was really MY room. 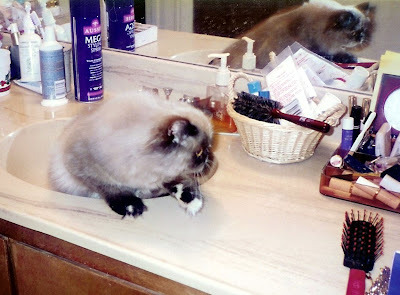 My litter box and food stayed in this room and I loved to sleep in the sink. There was a looooooong cabinet in the human litter box room, so I had plenty of room to hang around and watch mom. In this reflection, you see the front of younger Praline and the back of younger Praline. Ain't I cute? Mom sure does need a lot of stuff for her human floof! In this picture, Mom caught me climbing out of the sink. I think this is a pretty neat reflection also! My friend Fin sent me the letter P and I have to think of ten things I love that start with the letter P.
Paula, my mom! Of course she would be #1 on my list. Can I have a treat now Mom! Paw Paw (aka Paul), my grandpa bean. He always gives me bunches of treats when Mom isn't looking. Paper. 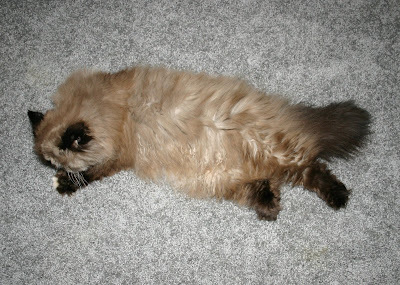 I love to lie down on any piece of paper that is on the floor. Purrs. Because they relax my mom after she has had a bad day! Plus it gets me scritches, belly rubs and more treats. Presents! Who doesn't like presents? Pumuckl and his mom Chica. They have so much fun together and give the greatest tours! Party Mix treats! and Temptations and Greenies and . . . Popcorn. I don't like to eat popcorn, but when Mom is eating popcorn, she is sitting on the sofa watching movies and giving me scritches and belly rubs. Petting. I just love it when my mom "pets" me. and last but not least, Pralines, because that is where I got my name from. Whew! That was tough! Did I do good? My grandma bean always says i look like a owl. When I want more treats, I give her my sweet meow and then just stare at her with my big eyes (the owl eyes!) It usually works! 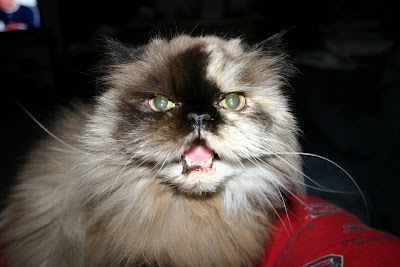 Mom: I just love Praline's little meow! I is so mad at my mom that I ain't using proper grammar! 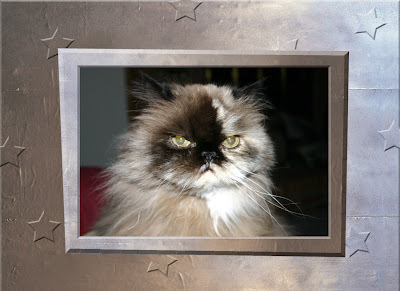 Mom has been so busy the past few days that she hasn't had much time for me or to help me visit my friends on the cat blog. 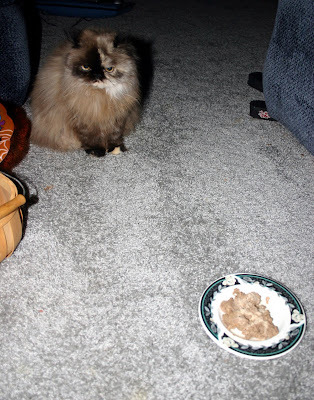 She tries to bribe me when she gets home late with bunches of treats (okay, I like the treats! ), but doesn't she realize I want quantity time as well as quality time!?! "Mom, I want attention and I want it NOW!" Pee Ess - I wish I knew how to work that flashy box thing! Mom fell asleep on the sofa last night with the computer on her lap! That should have been me on her lap!!! Splish, Splash, I was taking a bath . . . Excuse me! Can't you see I am taking a bath? A girl needs her privacy! Mom: Not so fast Praline, they are just being nice and you shouldn't get a big head. 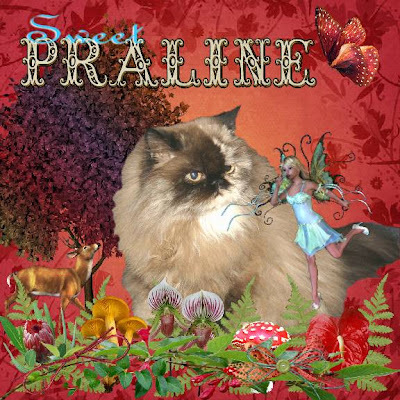 Praline: But Mom! You helped give me a big head. It's not my fault! Super Star! Super Star! Mom: I've created a monster . . .
"10. Sweet Praline is being visited by a Blue Nymph...and a vishus deer! Oh my! I hope she can banish the evil vishus deer before he causes too much trouble!" I didn't even see the vishus deer because all of my focus was on the Blue Nymph. I am sure all of my kitty friends were looking out for me. I just love my picture and really appreciate being included for this special post. 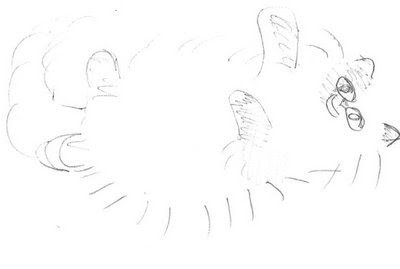 "I think I must attempt to draw Sweet Praline. I will need to buy more markers to get her coloring right! In the meantime, here's a 30 second quick sketch I drew on the back of my paycheck -- "
I think she has me just right, don't you? I may even let her rub my belly! 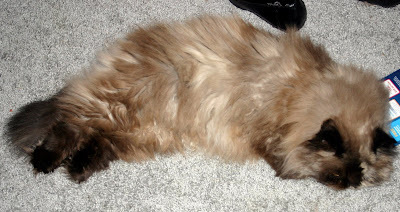 I think I need to send my belly shots to Sachie and Goma to be included on the new belly blog. Goma? Do I qualify? Pee Ess: Mom is home this weekend even though her roosters (Gamecocks) are playing football in Florida. She said she needed to save some green papers with the holidays approaching. 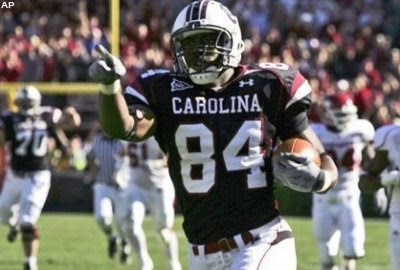 The South Carolina Gamecocks are playing the Florida Gators today at 3:30 pm on CBS. The Gators are favored to beat the Gamecocks by 21 points. Mom said we will just watch it on tv and hope for the best. 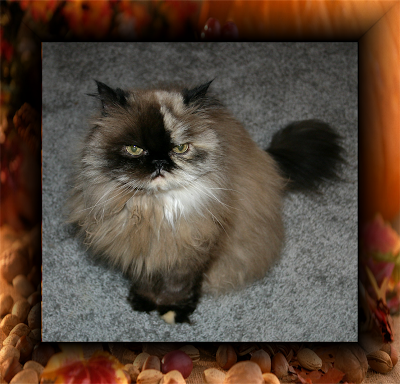 Note from Mom: A special thank you for including Praline on your blog. We were both very honored. I wish I was that artistically talented. 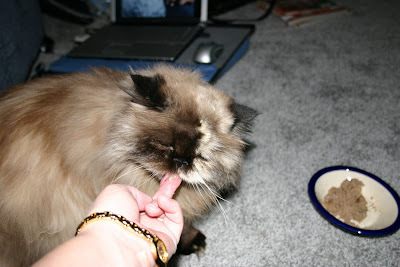 Mom says she wishes I was like most of the kitties on the cat blog and would eat anything. I refuse to touch "people food" and I am very particular about the stinky goodness that I eat. The company once changed the recipe for my stinky goodness and when mom opened the can, I smelled it, looked at her, and refused to eat any of it! Mom had to try about six different brands before she found one I liked. 1. I won't touch the food when mom serves it on the floor in the kitchen. I make her bring it to the living room at the foot of the sofa near her. She puts it on the floor and I just give her the look. 2. I then ignore the plate of food. 3. Mom then resorts to moving the food closer to me and rubs my floofy head. Oooooooo! That feels good, but I am still not eating. 4. Finally, Mom gets the idea and puts the stinky goodness on her fingers (She said it takes several hand washings to get rid of the smell) and I immediately eat the food off of her fingers that I have ignored for several minutes. 5. I then begin to realize that the food on the plate smells very familiar to the food on mom's finger. 6. 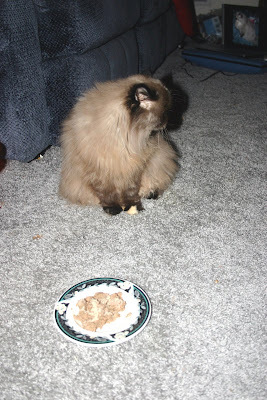 I finally begin eating the stinky goodness that Mom put out for me approximately 10 minutes earlier. Mom! This is good! Why didn't you give this to me the first time? 7. 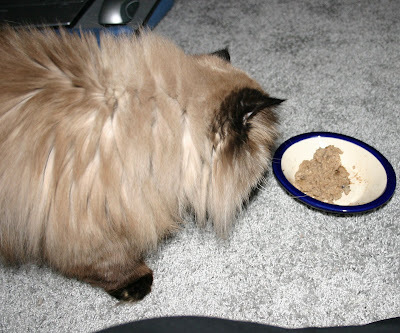 I will go back and forth eating from the plate several times (sometimes 2 hours later) and finish my stinky goodness. If she moves the plate back to the kitchen, I won't eat it, which drives Mom crazy. Please take that flashy box away, Mom. Can't you see I'm eating! 8. Of course, I am always ready for my treats! I could eat treats 24/7. Thank you to all of my friends who suggested quotes for yesterday's picture. The quote Mom thought best represented what I was doing during this photo shoot came from Eric and Flynn. "Of course I love you, now give me my treats." Pee Ess - Don't worry! 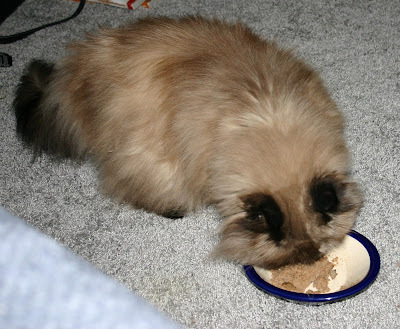 Mom leaves out dry food for me for free feeding and I eat that all of the time! Note from Mom: I know, I know. Praline has trained me well and all I do is contribute to my little spoiled Southern Belle. But how can I turn down that cute face? Looking left . . . Mom just loves this picture because she says I talk to her all of the time and she finally captured a photo that shows this. Mom says she is tired and wanted to come up with something unique for this picture, but her brain just wasn't working. T0 give you the background of this picture, Mom is sitting in her favorite spot on the sofa in front of the tv in her Gamecock PJs, and my treats just happen to be to her right. I am sitting between her legs and giving her the look and the mouth. What is the perfect caption for this picture? What am I saying? Why eat from the bowl when I can eat from Mom's fingers? Cassidy and I are watching the Veterans Day parade in Columbia, South Carolina this morning. Wow, Cassidy, those are some of the veterans Mom saw at the Reagan National Airport in Washington. When the annual Veterans Day parade rolls down Sumter Street in Columbia today, it will be viewed by some very special guests. Each of the 91 World War II veterans who will be on the inaugural Honor Flight to visit Washington memorials Saturday has been invited to sit a special VIP area to view the parade. I am standing tall to welcome the veterans of all wars. They fight for our freedoms that we enjoy everyday. 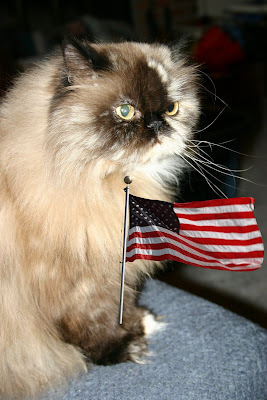 I wonder if any kitties are veterans like some of the woofies are. Hmmmmmmm. When Mom was at the airport in Washington, DC in September, she had the honor and privilege to see the World War II vets on the Honor Flight. She had her camera with her, so she took a video of the reaction of everyone in the airport. When the airport announcer said that the vets had arrived, everyone stopped what they were doing and began clapping and cheering. Honor Flight was initially conceived in 2004 by Earl Morse, a Physician Assistant and Retired Air Force Captain, to honor veterans he has taken care of for the past 27 years. Its sole purpose is to fly veterans to Washington D.C. to visit the memorials dedicated to honor their sacrifices. Honor Flight has flown more than 800 WWII veterans to the memorial. 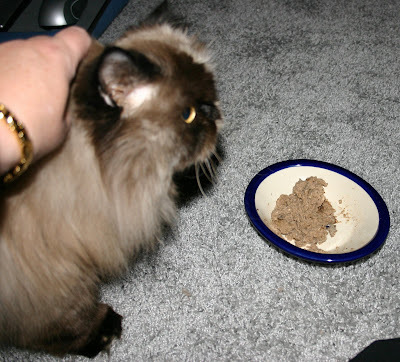 Paw Paw (my mom's dad) ALWAYS gives me treats when he comes over. However, this time, Mom was home and would you believe he stopped me after 5 treats?!? I jumped up beside him like I always do and when Mom walked in, he said, "NO." I think I will put out a "kitty alert" for help. We must keep moms away when the grandbeans are visiting so we can get all the treats we want. Now, if I can just figure out how to use this phone . . . I am now calling mom's football team the roosters because they are finally playing better. 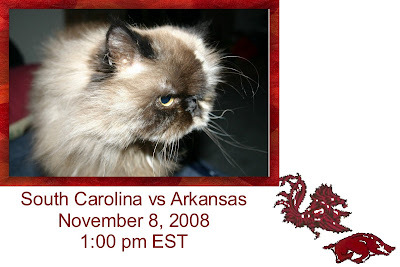 This weekend is homecoming at the University of South Carolina and the "Gamecocks" are playing the University of Arkansas and they are the "Razorbacks" (or hogs!). I know both chicken and pork are very tempting for my kitty friends out there, but I am hoping that you will continue to support my mom's team. The game is early today, so mom will be home before dark and we can cuddle together for the evening. I am watching the Gamecock attack and chase away that old Razorback! Okay, kitty mommies, this is your chance to get your "floof fix" today. 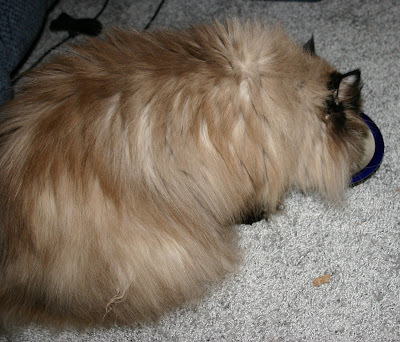 I am starting to get in my winter floof, so mom needs to brush me every day, sometimes two to three times a day! Hey Mom! I still think we should charge for belly rubs! We could make a fortune! Maybe Goma and I can go into business together. What do you think, Goma? Rub, rub, rub my belly. 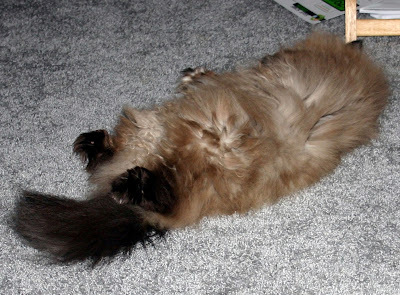 Stretching all the way out for the full floof experience. Now the "look" to go along with the floof. It sure makes my mom melt. Was that enough floof for you?